Over the past several years a myriad of new space startups have appeared. These range from those in the Earth observation sector building the “mega-set” of data about our planet to new launch companies, space tourism ventures, and other hardware and services startups. However, even with all the diversity among these companies, one thing seems to be being overlooked. What about downmass? One example of an upcoming need for downmass — the ability to transport material from space to the Earth — is space manufacturing. Blue Origin founder Jeff Bezos and many others have argued that manufacturing in space will be a major contributor to the space economy in the long term and may provide a platform by which space will truly become commercialized. Broadly speaking, there are four categories of space manufacturing. The first of which includes those objects made in space for use in space, such as tools and parts today, but ultimately larger hardware and habitats. The second category includes symbolic items meant to be space-flown and returned to Earth, such as the 3-D print of a gravity indicator I recently commissioned to be printed in January 2017 on the International Space Station and have donated to the Museum of Science and Industry in Chicago. The third category features objects that can only be manufactured in space because of their geometric and design parameters, and which could not survive launch but could survive a return to Earth. Finally, there are items that have far superior quality when manufactured in space, but need to be returned to Earth to be purchased and used by customers. One example of this last category is fiber optic cables used for broadband communications. Fibers made on Earth, and thus made in the presence of gravity, have impurities and defects in the glass that adversely affect transmission speed and quality. This is particularly important for cables transmitting over long distances, such as those spanning the oceans. When these same cables are made without gravity, their quality dramatically increases, reducing the need for costly repeaters required for conventional long-distance fiber optic cables. This provides a huge opportunity, as fiber optic cable manufacturing is a multibillion-dollar industry. The world’s leader in space manufacturing today is Made In Space, a startup that has developed and flown 3-D printers on the ISS. 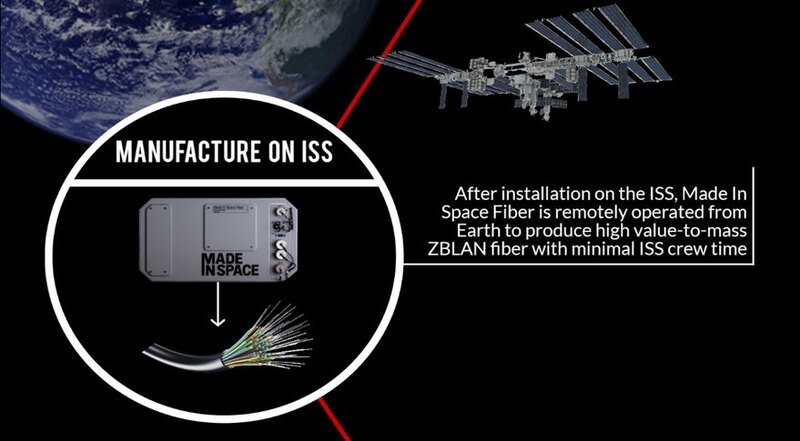 They are in the driver’s seat to manufacture high-end optical cables in space, and announced in July their intention to do so. However, assuming they are successful and that demand for space-based manufactured items increases, who will supply the downmass? In other words, how will those objects be safely and economically transported back to Earth? There are few options today: of the cargo vehicles that currently service the ISS, only SpaceX’s Dragon can return cargo to Earth, and that downmass must be shared among other commercial ISS users as well as NASA and other agencies. This issue could be compared to the massive expansion of telecom capacity in the 1990s. As the capacity was built from node to node, very little thought was given to the proverbial last mile to the consumer’s home. This ended up being both a constraint and a business opportunity for companies and investors. Perhaps, downmass in space will provide a similar situation and provide budding entrepreneurs with a new category of business opportunity for the industry to tackle. Dylan Taylor is a leading angel investor. He has several investments within the smallsat and Earth observation sector, including OmniEarth, Cape Analytics, Planet, RBC Signals, Ardusat, York Space Systems and LeoLabs.